Praise for Obama's sixth State of the Union; IBM issues disappointing revenue forecast; NFL's "deflategate" investigation gains steam. 1. 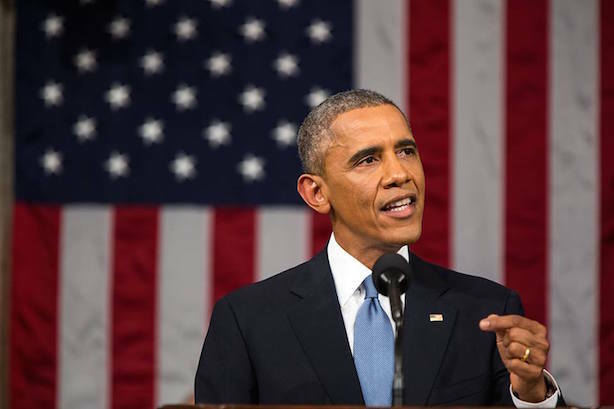 President Barack Obama delivered his best-reviewed State of the Union Address to date on Tuesday night, confidently attempting to turn the page on the economic crisis of 2008 and 2009 and the wars in Afghanistan and Iraq. The economy, jobs, and families were mentioned the most, while gun control, North Korea, and the Affordable Care Act received no direct references. In a notable media relations move, the Obama administration released the text of the speech in full and without embargo before it was delivered, a first for a White House. (It also teased that the president would wear a brown suit, which he did not). Yet two of its most memorable moments were off-the-cuff exchanges with the Republican congressional majority in the House chamber. 2. CNBC and The Wall Street Journal are running live blogs from the World Economic Forum in Davos. On the agenda on Wednesday: economic issues in the European Union, Russia, and China. 3. The National Football League has found that 11 of the 12 game balls used by the New England Patriots in Sunday night’s romp over the Indianapolis Colts in the AFC Championship were significantly underinflated, according to ESPN. The Patriots, of course, are preparing to face off against the defending champion Seattle Seahawks a week from Sunday in Super Bowl XLIX. 4. Standard & Poor’s has agreed to two settlements with federal regulators and state officials over a series of charges about its practices. The penalties are so large, they could wipe out the organization’s operating profit for a year, according to DealBook. 5. Tom Kowaleski, a former communications executive at General Motors, BMW, and Chrysler, died on Tuesday. He was 63. Kowaleski has been credited with innovating a number of Chrysler events in the 1990s that grabbed the automaker considerable mainstream media attention. 6. IBM issued a profit forecast on Tuesday that missed analysts’ expectations. Its revenue also dropped 12% in the fourth quarter, marking the 11th consecutive period it has not reported a revenue increase. Your call: Were the Brady and Belichick deflategate press conferences believable?